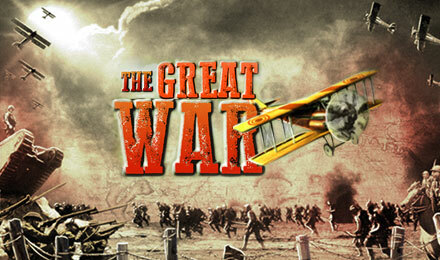 The Great War is a 5 reel and 50 payline war-themed video slot game. There are FREE spins to be won, rewarding sticky wilds and more. Take a spin on The Great War reels today for your chance to win big! There are 5 reels and a whopping 50 paylines, a FREE Spins bonus that is triggered when 3 or more Zeppelin Scatters appear, a game logo Wild symbol that can replace any other reel symbol (except the Scatter), sticky wilds and so much more! Good luck!